When’s the last time you actually took time off? Time to go away and detox, unplug, sit in the sun or in the shade and just be. For most of us it’s been far too long. As a society we’re bad about taking the time to truly do this. Even time off is used to get things done. Among employees who receive vacation and/or paid time off, 85 percent report taking at least some time off in the past 12 months while 15 percent report taking no vacation/paid time off. Over the same time period, one in four (25 percent) report taking 100 percent of their eligible time off. Two in five (40 percent) employees report taking 25 percent or less of their eligible time off. Taking paid time off, however, doesn’t mean it’s for a vacation as one in 10 (11 percent) employees who took vacation time in the past 12 months report using paid time off to interview for another job. Among those 18-34 years old, one in five (20 percent) say they’ve used vacation time to interview for another job. So, while you’re not alone if you’ve slacked off on the art and necessity of vacating your regular job and duties, it doesn’t mean you don’t need a recharge. Once you give your brain and body a break, even if it’s just a full day, you are more likely to have creative juices flowing and to come up with answers to problems that have been stumping you. 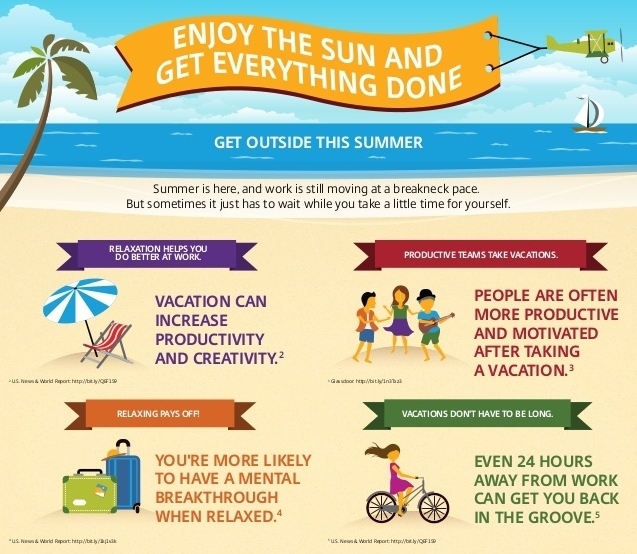 While it may seem counter-intuitive, taking time off can truly help your business. As we approach Labor Day weekend, we want to challenge you to take some time for yourself and your family to help you rejuvenate and come back a refreshed and more power-house version of yourself. Part of taking care of your business is taking care of yourself. Have a great holiday weekend and don’t forget to relax and enjoy yourself!